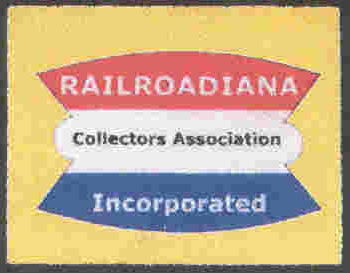 Pictured below are some of the items in my personal railroadiana collection. 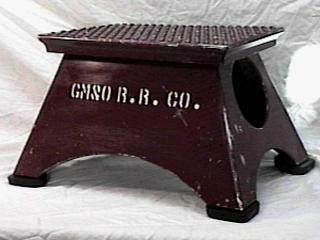 A RARE Gulf Mobile & Ohio step box, built by the Morton Co.
More Gulf Mobile & Ohio relics including silver, china and five different types of lanterns. (RIGHT) A GM&O switch lamp. 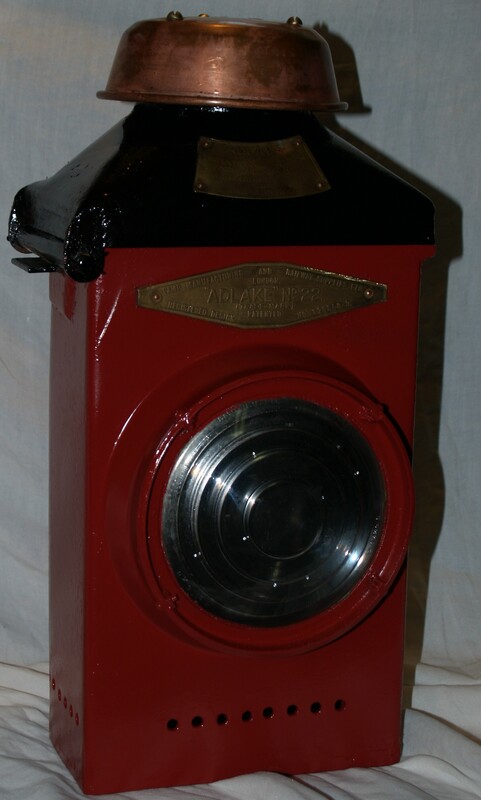 (LEFT) "The PULLMAN" Conductors lantern manufactured by Adams & Westlake. 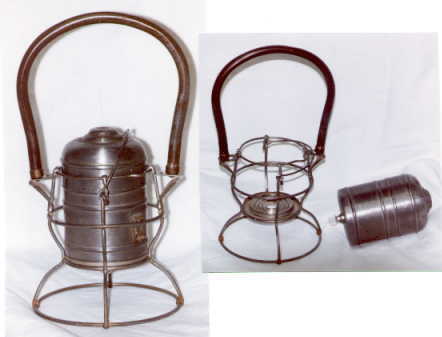 (CENTER) This nickle finish, double guard lantern was manufactured by Porters Son & Co. The nicely cast globe is marked "DL&W". (RIGHT) This fixed globe lantern with bracelet style handle, was made by the New England Glass Company, circa 1860. The globe is wheel cut and reads "B&ARR". This unique "No. 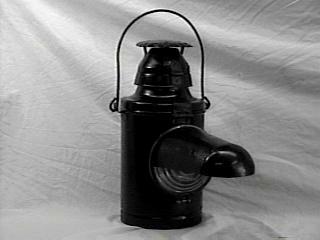 6" electric lantern was made by the Adams & Westlake Company. 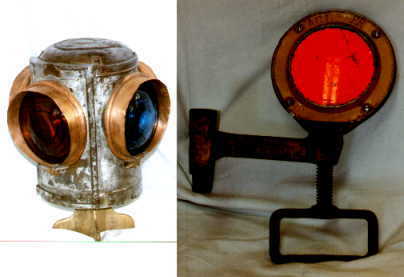 (LEFT):This locomotive Head Light was built by the Pyle National Company, and saw service on an industrial steam switch engine. 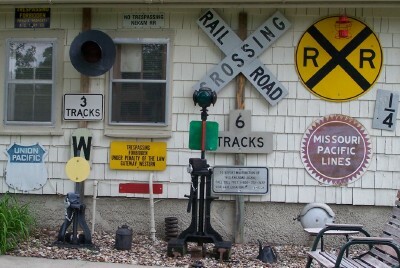 (RIGHT): a selection of caboose lights. 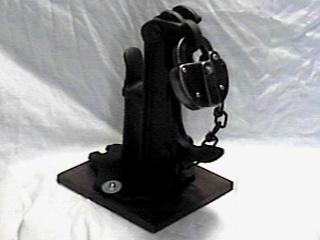 (LEFT)A switch stand lever rest assembly from the small Chicago & Alton (later Gulf Mobile & Ohio) yard in Independence Mo., secured by a GM&O lock. 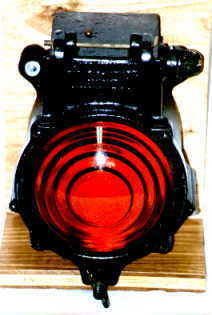 (RIGHT) An End of train marker light manufactured by Pyle National. (FAR LEFT): An unmarked switch light with copper hoods and a brass mounting foot. 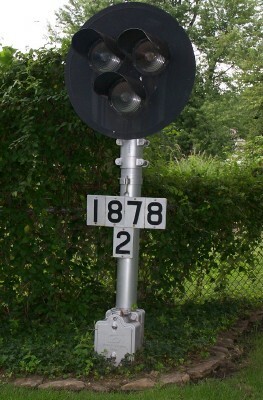 (CENTER LEFT): A more unusual end of train marker with green and red reflectors which are turned to the proper aspect with the handle. Marked "ACL RR". (CENTER RIGHT): An electrically powered semaphore light by Peter Gray & Sons. 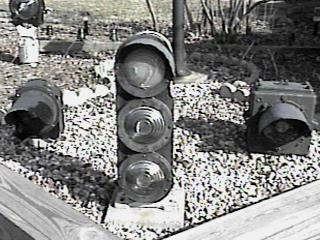 (FAR RIGHT): Older model train order light, also built by Peter Gray & Sons. 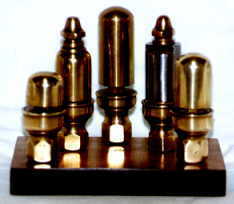 A collection of brass "peanut" whistles. 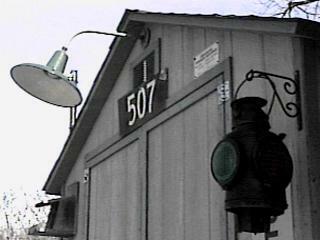 (LEFT)Two "cannonball" classification lights, and a sequentially rotating beacon, built by Prime Mfg. 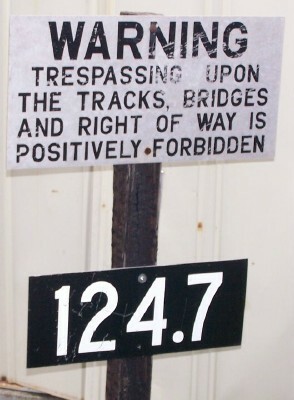 Co., which saw duty on top of a Burlington Northern locomotive. 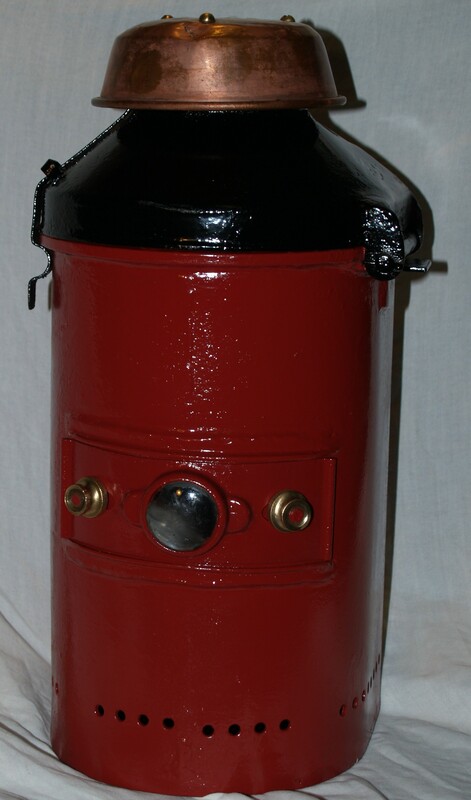 (RIGHT) A WWII era train order light, complete with blackout hood, made by Handlan. 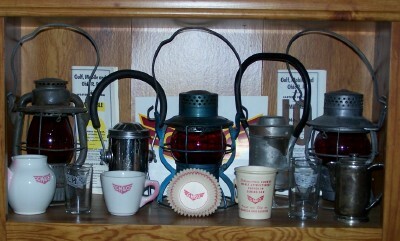 A collection of 3 switchyard lights; 2 single units, and one 3 position dwarf, a small switchstand, and several misc. 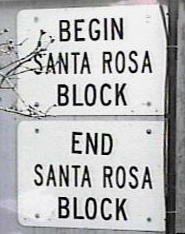 railroad and crossing lights. 2 from Union Pacifics western lines, and an old switch light hanging on my 'equipment shed'. 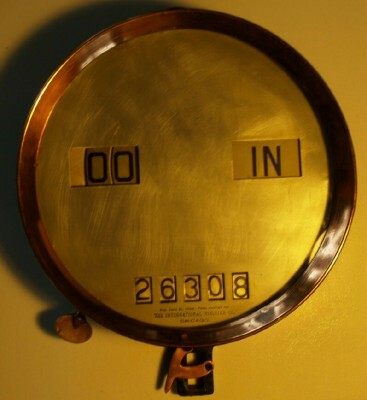 Left: A trolley passenger counter, circa 1900, manufactured by International Register Co. 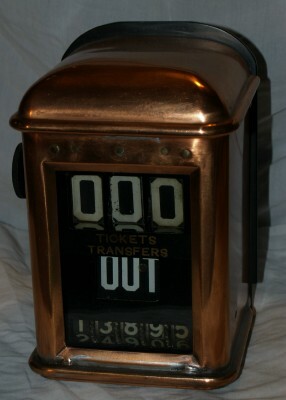 Right: a beautiful copper clad counter. An ADLAKE No. 22 lantern. Copper cap is marked LMS (Great Britain). 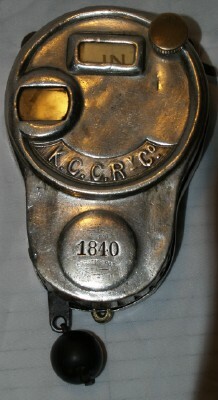 A rare passenger counter from the Kansas City Cable Railway Company. In addition, I am proud to be a contributor to "The Illustrated Encyclopedia of Railroad Lighting Vol. 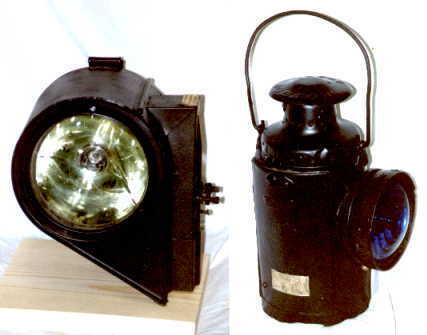 1, the Railroad Lantern" (supplement), and "The Illustrated Encyclopedia of Railroad Lighting Vol. 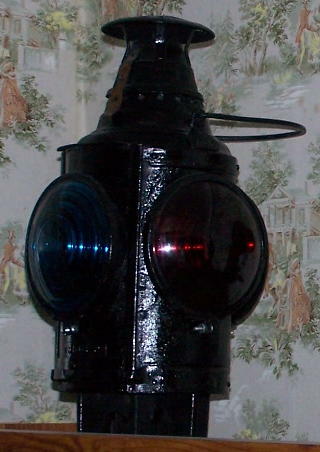 2, The Railroad Signal Lamp", both by the late Richard Barrett. Several other items from my collection are featured in these publications. If you are interested in railroad lamps or lanterns, and you can find a copy, these books should be in your library!